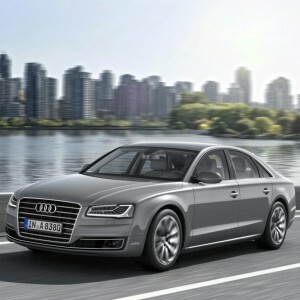 Styling, technology and efficiency boosts are set to grace the new Audi A8, which is to be revealed at the Frankfurt Motor Show next month. The luxury saloon, to be released in January, will offer more powerful yet more efficient engines, with seven petrol and diesel versions to choose from. Most efficient is the 3.0litre TDI, which returns up to 47.9mpg and 155g/km of CO2 – 3g/km lower than the outgoing version. Meanwhile, the supercharged 3.0litre TFSI petrol increases from 290hp to 310hp, while the V8 twin-turbo 4.0litre TFSI receives a boost from 420hp to 435hp. The 3.0litre TDI clean diesel increases from 250hp to 258hp and the 4.2litre TDI clean diesel gains 35hp, taking it to 385hp. Tellingly, the 4.0 TFSI now powers the A8 from 0 to 62mph in 4.5seconds when paired with Quattro all-wheel drive. All engines satisfy the Euro6 standard, assisted by friction-reducing measures which cut fuel consumption by up to 10%. The luxury car also has new design headlamps and rear light elements, as well as a re-sculpted bonnet. Improvements have also been made to the optional assistance systems, including active lane assist, park assist, nigh vision assistant and the windscreen-projected head-up display. Full pricing and specification information will be announced closer to the launch date.